The Elephant in the Room: Og, Gog, Magog and………OIL??? – Coercion Code – "Dark Times are upon us"
As of late, the current news headlines have been centering around global events that pertain to the Golan Heights, Gaza, the West Bank, the status of Jerusalem, Hezbollah, Hamas, Iran, Syria, Turkey and Russia. Those who don’t know Bible prophecy find it it difficult to understand but the Word of God is never wrong. An old friend of mine once told me that truth and time go hand in hand. I believe what we are witnessing today is the an acceleration factor pertaining to events in the Middle East that directly involve Israel and ultimately point to the return of the LORD Jesus Christ. The Golan Heights, a rocky plateau in south-western Syria, has a political and strategic significance which clearly become advantageous to its owner. As of now, both Iran and Lebanon would have direct access through Israel via the Golan Heights. I suggest this area may now be one of financial significance. The pro-Israeli magazine, Tablet, in its current edition published a story ‘Billions of Barrels of Israeli Oil’ Tapped in the Golan Heights. It’s already declared as “Israeli oil” even with the international community still consider the Golan Heights as Syrian occupied territories under International Law. More on that in a moment. Historically speaking, the British colonial power gave the Golan to France’s Syrian colony in 1923. After the 1948-49 Arab-Israeli War, the Golan Heights were partly demilitarized by the Israel-Syria Armistice Agreement. Furthermore, Syria attacked Israel in 1967 and lost the Golan Heights. Syria had occupied it for 44 years. During the closing stages of the Six-Day War in 1967, Israel seized the Golan Heights from Syria and as a result, most of the Syrian Arab inhabitants fled the area during this conflict. Netanyahu also referred to Trump as a modern Cyrus after the signing of the Golan Heights recognition. In his remarks, Benjamin Netanyahu mentioned the great leaders through history who have had a profound influence on the Jewish people and the state of Israel, including King Cyrus who liberated the Jews and issued an edict for the rebuilding of the Jewish temple in Jerusalem.This was the second time the comparison was made. For what it’s worth, remember that President Trump announced the moving of the U.S. Embassy to Jerusalem and recognized it as Israel’s capital. This was done on May 14, 2018, 70 years from the very birth of the nation of Israel which was on May 14, 1948, Trump’s formal recognition of the Golan Heights occurred on Purim, the festival that recognizes the utter defeat of the enemies of Israel. 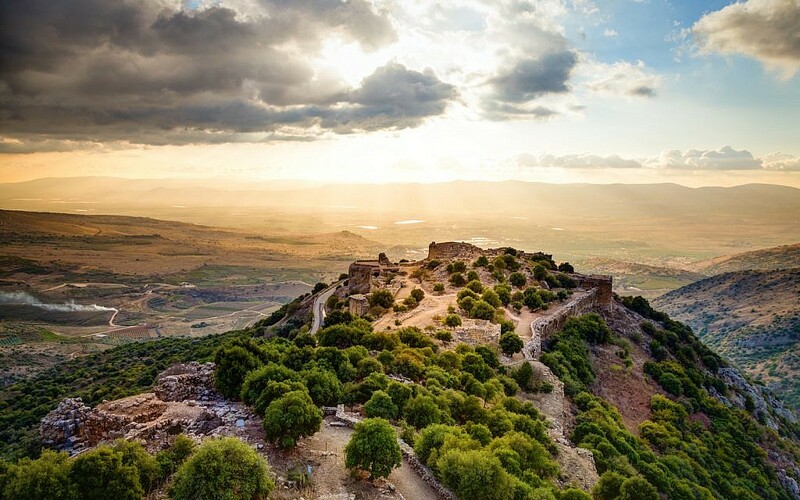 Biblically speaking, the Bashan region, now known as the Golan Heights, is a part of the biblical territory promised to the Patriarch Abraham and the people of Israel for an everlasting covenant – the Covenant of the Parts – recounted in Genesis 15. Genesis 15: 1-21-After these things the word of the Lord came unto Abram in a vision, saying, Fear not, Abram: I am thy shield, and thy exceeding great reward.2 And Abram said, Lord God, what wilt thou give me, seeing I go childless, and the steward of my house is this Eliezer of Damascus?3 And Abram said, Behold, to me thou hast given no seed: and, lo, one born in my house is mine heir.4 And, behold, the word of the Lord came unto him, saying, This shall not be thine heir; but he that shall come forth out of thine own bowels shall be thine heir.5 And he brought him forth abroad, and said, Look now toward heaven, and tell the stars, if thou be able to number them: and he said unto him, So shall thy seed be.6 And he believed in the Lord; and he counted it to him for righteousness.7 And he said unto him, I am the Lord that brought thee out of Ur of the Chaldees, to give thee this land to inherit it.8 And he said, Lord God, whereby shall I know that I shall inherit it?9 And he said unto him, so him all these, and divided them in the midst, and laid each piece one against another: but the birds divided he not.11 And when the fowls came down upon the carcasses, Abram drove them away.12 And when the sun was going down, a deep sleep fell upon Abram; and, lo, an horror of great darkness fell upon him.13 And he said unto Abram, Know of a surety that thy seed shall be a stranger in a land that is not theirs, and shall serve them; and they shall afflict them four hundred years;14 And also that nation, whom they shall serve, will I judge: and afterward shall they come out with great substance.15 And thou shalt go to thy fathers in peace; thou shalt be buried in a good old age.16 But in the fourth generation they shall come hither again: for the iniquity of the Amorites is not yet full.17 And it came to pass, that, when the sun went down, and it was dark, behold a smoking furnace, and a burning lamp that passed between those pieces.18 In the same day the Lord made a covenant with Abram, saying, Unto thy seed have I given this land, from the river of Egypt unto the great river, the river Euphrates:19 The Kenites, and the Kenizzites, and the Kadmonites,20 And the Hittites, and the Perizzites, and the Rephaims,21 And the Amorites, and the Canaanites, and the Girgashites, and the Jebusites. Deutoronomy 4: 40-49-40 Thou shalt keep therefore his statutes, and his commandments, which I command thee this day, that it may go well with thee, and with thy children after thee, and that thou mayest prolong thy days upon the earth, which the Lord thy God giveth thee, for ever.41 Then Moses severed three cities on this side Jordan toward the sunrising;42 That the slayer might flee thither, which should kill his neighbour unawares, and hated him not in times past; and that fleeing unto one of these cities he might live:43 Namely, Bezer in the wilderness, in the plain country, of the Reubenites; and Ramoth in Gilead, of the Gadites; and Golan in Bashan, of the Manassites.44 And this is the law which Moses set before the children of Israel:45 These are the testimonies, and the statutes, and the judgments, which Moses spake unto the children of Israel, after they came forth out of Egypt.46 On this side Jordan, in the valley over against Bethpeor, in the land of Sihon king of the Amorites, who dwelt at Heshbon, whom Moses and the children of Israel smote, after they were come forth out of Egypt:47 And they possessed his land, and the land of Og king of Bashan, two kings of the Amorites, which were on this side Jordan toward the sunrising;48 From Aroer, which is by the bank of the river Arnon, even unto mount Sion, which is Hermon,49 And all the plain on this side Jordan eastward, even unto the sea of the plain, under the springs of Pisgah. The town of Bashan was located in the middle of the Golan Heights. It was under the rue of the northern of Goliath, yet another giant whose name was Og. Now let’s fast forward to the 21st Century. What could make the Golan Heights even more valuable to Israel? How about the discovery of a huge oil deposit? The Russian Times (RT) and many other sources report that Israel has indeed discovered a major deposit of oil on the Golan Heights. In addition, Israel has granted a Golan Heights oil drilling license to an American Company. Recent tests have indicated that there very well may be large oil and gas deposits in the Golan!!! This discovery just may help readers to understand why Russia is making such a strong play to support the Assad regime in Syria. It also may explain why Netanyahu is lobbying the US to support its bid to annex the Golan Heights in view of the failed state of Syria. It appears that the prophetic scenario in Ezekiel 36-39 is beginning to take shape as Russia moves more military assets into and close to Syria. Turkey is also sending troops and has troops situated in Northern Syria. Iran too has troops amassed north of the Golan Heights. Is this the spoil and plunder that is spoken of in Ezekiel 39?? I don’t foresee the Golan Heights in a land for peace deal. Ezekiel 38:1-12-And the word of the Lord came unto me, saying,2 Son of man, set thy face against Gog, the land of Magog, the chief prince of Meshech and Tubal, and prophesy against him,3 And say, Thus saith the Lord God; Behold, I am against thee, O Gog, the chief prince of Meshech and Tubal:4 And I will turn thee back, and put hooks into thy jaws, and I will bring thee forth, and all thine army, horses and horsemen, all of them clothed with all sorts of armour, even a great company with bucklers and shields, all of them handling swords:5 Persia, Ethiopia, and Libya with them; all of them with shield and helmet:6 Gomer, and all his bands; the house of Togarmah of the north quarters, and all his bands: and many people with thee.7 Be thou prepared, and prepare for thyself, thou, and all thy company that are assembled unto thee, and be thou a guard unto them.8 After many days thou shalt be visited: in the latter years thou shalt come into the land that is brought back from the sword, and is gathered out of many people, against the mountains of Israel, which have been always waste: but it is brought forth out of the nations, and they shall dwell safely all of them.9 Thou shalt ascend and come like a storm, thou shalt be like a cloud to cover the land, thou, and all thy bands, and many people with thee.10 Thus saith the Lord God; It shall also come to pass, that at the same time shall things come into thy mind, and thou shalt think an evil thought:11 And thou shalt say, I will go up to the land of unwalled villages; I will go to them that are at rest, that dwell safely, all of them dwelling without walls, and having neither bars nor gates,12 To take a spoil, and to take a prey…. Nahum 1:1-9- The burden of Nineveh. The book of the vision of Nahum the Elkoshite.2 God is jealous, and the Lord revengeth; the Lord revengeth, and is furious; the Lord will take vengeance on his adversaries, and he reserveth wrath for his enemies.3 The Lord is slow to anger, and great in power, and will not at all acquit the wicked: the Lord hath his way in the whirlwind and in the storm, and the clouds are the dust of his feet.4 He rebuketh the sea, and maketh it dry, and drieth up all the rivers: Bashan languisheth, and Carmel, and the flower of Lebanon languisheth.5 The mountains quake at him, and the hills melt, and the earth is burned at his presence, yea, the world, and all that dwell therein.6 Who can stand before his indignation? and who can abide in the fierceness of his anger? his fury is poured out like fire, and the rocks are thrown down by him.7 The Lord is good, a strong hold in the day of trouble; and he knoweth them that trust in him.8 But with an overrunning flood he will make an utter end of the place thereof, and darkness shall pursue his enemies.9 What do ye imagine against the Lord? he will make an utter end: affliction shall not rise up the second time. The land that Nahum mentioned in the verses above include Bashan, Carmel, and Lebanon. These places all describe the Golan Heights that separate Israel from Syria and Lebanon. Remember that Turkey is also mentioned in Ezekiel 39 as is Bashan or the Golan Heights. The bottom line here is that God’s prophetic word is coming to pass. It is very possible that the enemies of Israel are gathering for an attack from the Golan Heights. Remember, in the Bible whenever Israel was invaded, the invasion always came from the North. Could current developments in this area coinciding with this being the 70th year of the birth of Israel as a nation be setting the stage for the onset of the 70th week of Daniel also known as the time of Jacob’s trouble, i.e. the 7 year tribulation period? ?